You're a big thinker with plenty of vision, heart, and passion. You've got a big idea, a business you want to build, and/or a dream you're ready to achieve. So how do you bring that vision into reality? How do you unlock the step by step plan to the Big Picture of YOU - your life, your business, and your success? Enter Michelle McCullough. Successful serial entrepreneur, acclaimed speaker, and The Woohoo Radio Network's resident Business and Success Strategist. Michelle has used her marketing know-how to help countless business owners achieve their goals by implementing proven, strategic methods, and she has the smarts, strategies, and experience to help you improve your life and take your business to the next level. Whether you're struggling to balance your business and personal life, wondering how to get more customers through the door, looking for ways to work smarter, or are overwhelmed by the everyday stresses of being a business owner, Michelle can help. Stop wishing for success. Stop hoping for happiness. Start your week off right and tune in Mondays for Make It Happen With Michelle McCullough on The Woohoo Radio Network from 5-6pm Central. When many 12-year-olds were asking for Sony Walkmans and Girbaud jeans, Michelle McCullough was begging her mom for a Franklin Day Planner. She was elated on Christmas morning to open a box of success goodness and spent that holiday break writing a mission statement, prioritizing to-do lists, and getting organized. Today, twenty years later, Michelle is a success expert. She helps entrepreneurs and professionals master productivity, time management, leadership, and effective goal achievement. Michelle took advantage of her early success and business education and started her first business, Doodads Promotional Products, when she was nineteen. Doodads has run "in the black" every year since its inception. Michelle has also created, grown and/or sold four additional businesses in the last fourteen years. During that time, Michelle also worked for two advertising agencies, a television station a newspaper and multiple start ups. Her successful experiences created a demand for her business consulting skills, and she has spent the last five years coaching and consulting with entrepreneurs and small business owners across the country. Michelle is a sought- after speaker and trainer, teaching business and success principles to corporations and associations. Whether it's a group of high powered entrepreneurs or a room full of high-energy youth, Michelle captivates, motivates and inspires. Michelle's been seen on HP's Small Business website, on Entrepreneur.com, and in Utah Business Magazine. She's been interviewed on Health Wealth & Everything Else Radio, and she was recently named one of the "40 under 40" in the Utah Valley Business Q. Additionally, Michelle is the managing director of Startup Princess, an international organization for women entrepreneurs. Michelle now brings her knowledge and experience to the airwaves. "Make it Happen with Michelle McCullough" is a radio show designed to bring you success principles where work and life intersect. From life balance to goal achievement and from marketing to staffing, Michelle's expertise now comes - live and on the air - from her brain to yours. Your financials are an important part of business success. By your profit and loss statement I can learn a lot about your business. Since financial mismanagement is one of the top reasons businesses go under, I invited financial expert Hilary Hendershot to be on today's show! Join us live right here are 3:00 PM Pacific, 4:00 PM Mountain time. If you cant listen live, check back later and you can listen or download the replay at your convenience! You won't want to miss this insightful interview! Learn more about today's guest! Hilary Hendershott, MBA, CFP® is the Founder & Chief Executive of Hilary Hendershott Financial, as well as the founder of Your Rich Retirement Academy and the Million Millionaires Campaign. Hilary is a TEDx speaker and a resident financial expert for DailyWorth’s Connect platform. She’s regularly featured in Forbes, the Wall Street Journal, Investopedia, NPR's Marketplace and Women 2.0. With nearly 30 television appearances so far, she’s the go-to expert in Silicon Valley for the NBC nightly news where they call her "The Investor's Voice of Reason.” Hilary is also an experienced wealth manager and financial coach. She has worked for nearly 15 years with affluent investors who want to preserve their wealth and make it grow. This year, Hilary has announced her campaign to empower one million women to become millionaires. Her passion is empowering women to take control of their money and happiness, and achieve their financial goals. It was great to have EksAyn on the show to share his expert advice on sales and getting past the gatekeeper. While you’re there, leave a review! I always love to hear your feedback! Get EksAyn’s Book The Key To The Gate on Amazon. EksAyn is an author, sales and negotiation expert, and speaker. Recently featured on Forbes, EksAyn’s new book, The Key to the Gate: Principles and Techniques to Get Past Gatekeepers to the Decision Maker, has sold internationally. EksAyn has been “in the trenches” of sales for years. He has successfully sold to large and complex organizations. He has taught sales and negotiation principles to numerous audiences. With his diverse sales background and education in psychology, he uses proven, specific psychological principles and tactics in his sales and negotiation and teaches these in a refreshing and interactive way. Working SMARTER, not harder on your social media strategy! Using social media to get media opportunities, integrating a graphics campaign people will share, when to “pay to promote” & more! - Unlimited access to the videos. Can't join us live? No problem! The sessions are recorded for you to watch at your convenience. - Audio download files of the four live trainings for you to listen to on the go. - Digital Copy of the Social Media Monthly Planner. - Digital Copy of the Marketing Action List. A daily, weekly and monthly schedule for keeping up with social media. - Private Google+ Community to ask your questions to Michelle and get feedback from the rest of the group. "Michelle McCullough helped me DOUBLE my Twitter following within 30 days! Her proven strategies are a sure way to create a stronger social media presence, which is key in getting your message & marketing out to more people. I am grateful to have had her help!" "Michelle McCullough has an uncanny and quick ability to tune in to your message, and transform that into marketing strategies that get results. She's got a brilliant brain, a happy heart, and is a master at getting you into meaningful action. One Strategy Storm with Michelle will swirl up a host of new ideas, initiatives, and action steps that will forever change what's happening in your business. Amazing!" In addition to being a serial entrepreneur, Michelle is a sought after business strategist and speaker. She’s the show host for Make It Happen Radio and the creator of “Marketing Mastery” coaching program and self-study system for entrepreneurs. With over 15 years of marketing experience, she’s worked in every aspect of the industry. She’s worked at three advertising agencies, a television station, started her own newspaper, and ultimately created her own successful marketing consulting practice in operation for over six years. Michelle believes you can grow a thriving business without sacrificing a meaningful personal life. The secret lies in planning and time management. Her book, “The Time Blueprint for Entrepreneurs” is an Amazon.com #1 Bestseller. She’s been featured in numerous media outlets including entrepreneur.com, UVBQ’s 40 under 40 and is the Managing Director for Startup Princess an international organization for women entrepreneurs, where they have over 271,000 followers on twitter and have been featured by Forbes as one of the top 10 resources for women entrepreneurs. As a mother of two small children she knows there’s no time to mess around. It’s time to Make It Happen. My biggest regret in college is not having more fun. :) My second biggest regret is not taking more English and writing classes. As a "grown up" I wish I had taken more business writing, more creative writing and more editing. I write every day. Join me on today's Make It Happen Radio, where I get to interview Dr. Brown on the importance of the written word and how we can overcome our shortcomings to write effectively, everything from a personal thank you note to a business press release. Check out Laura's course on How To Overcome Writer's Block here. Laura Brown, PhD, has taught writing to just about everyone—from corporate executives to high school students. Her expertise encompasses instructor-led training, individual coaching, classroom teaching, and e-learning development, as well as audio, video, and webinar training for businesses, non-profits, and educational institutions. She has more than twenty-five years’ experience providing training and coaching on a variety of writing projects, with special expertise in designing customized writing training programs for organizations. She has partnered with Columbia University and General Electric to create a series of online business writing courses and has also worked with global companies helping executives from other countries transition to American business-communication conventions. She has also taught composition and literature at Columbia University and business and technical writing at Iona College. She lives in New York. Congrats to Laura for making "How to Write Anything" a #1 Amazon Bestseller in Business Communication! Social Media is constantly changing, which is why Michelle invests time and money every year into staying up to date on the latest strategies. If you’re looking for a content rich (and not boring) speaker, book Michelle for your next business conference or event. 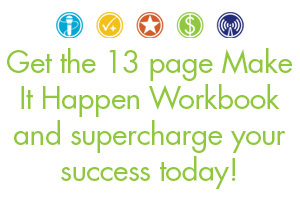 Get the 13 Page Make It Happen Tool Kit FREE!